As a member of the Ace Hardware blogger team they asked us to help set up a neighbor with a particular do-it-yourself need (lucky neighbor). One of our neighbors who always graciously watches our home when we are gone and collects are mail is an avid gardener and we decided to help her organize her space a bit more as well as provide some great new tools for her garden center. It all starts with a shovel and the above trowel from Ace Hardware is priced right and we particularly love the feel of a wood handle and look of chrome. This basic trowel has many uses and is a staple of any home garden center. Next to a trowel a set of bypass pruners is essential for maintaining the health of your backyard plants. Our neighbor has a bunch of gorgeous bougainvillea that are in need of constant trimming and pruning. These bypass pruners are made of vanadium steel and have a locking safety latch. But the key ingredient to our neighbors new home gardening center was a deck box. 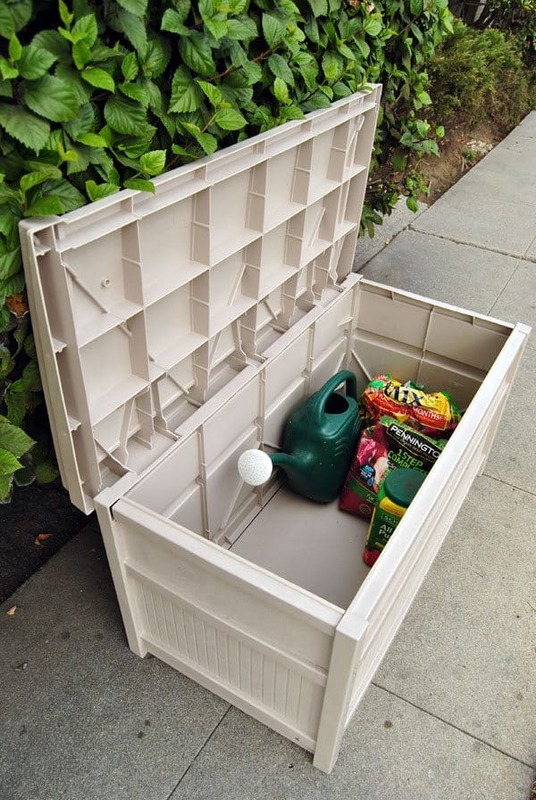 Deck boxes are used outdoors and can store all of your garden tools, watering cans, soil and anything else that you need easy access to but want to protect from the elements. They can also be used to hide away outdoor cushions to help prevent mold and to keep them clean. Our neighbor needed a deck box to store all of her extra soil and seeds as well as her new gardening tools and watering pail. What’s nice about the deck box is that it also doubles as a seat so it can be used and not hidden away when guests come over. 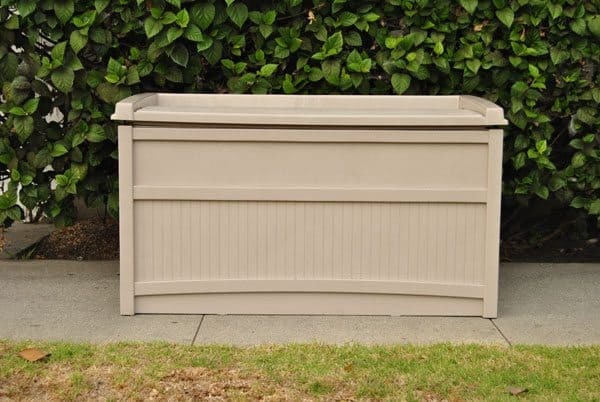 The Suncast 50 gallon deck box our neighbor chose comes unassembled but within 5 minutes you’ll have it snapped together and ready to use (no tools required). 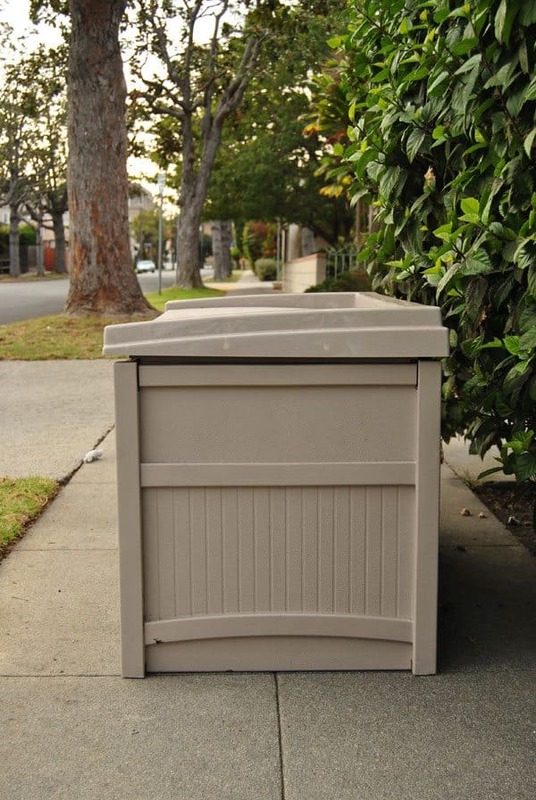 The neutral color works in any home and it’s easy to clean and is light enough to be moved anywhere in your yard.